Last week I hosted our Book Club dinner at my house. I thought I would share a few recipes from the evening that seemed to be a hit. 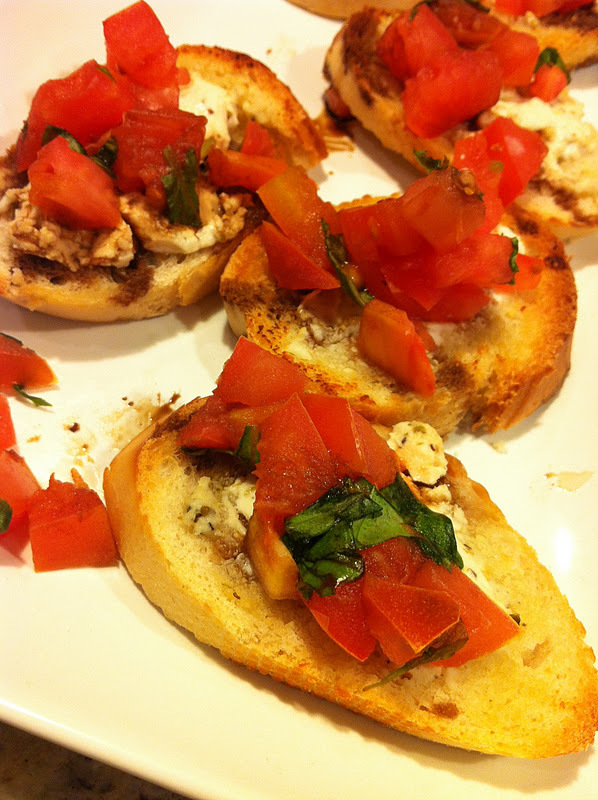 This bruschetta was super easy and I added my own spin to it with some goat cheese. Enjoy! Rinse off tomatoes and basil. Dice tomatoes into small cubes and place in large mixing bowl. Next, dice fresh basil into small, thin slices and place into bowel with tomatoes. Drizzle with 1-2 teaspoons olive oil. Season with salt and pepper. Mix well and set aside. Then, slice bread into thin slices. Place on baking sheet. Press clove of garlic and mix with olive oil. Using a pastry brush, brush garlic/olive oil mix onto bread. Then spread goat cheese generously over each slice of bread. Place under broiler until bread is crispy. When the bread is done, scoop about 1-2 tbsp bruschetta mix over top of bread. Drizzle with balsamic vinegar and serve. Enjoy! I also made Peach Sangria, Chocolate Chip Cookie Delight, and Parmesan Roasted Tomatoes. The main course was Spinach and Mushroom Lasagna Roll-Ups with gorgonzala sauce (funny story to that part I'll share later). Stay tuned and I'll share the following recipes this week.